From now until August 25, you have a chance to win a free copy of Launch Pad from Stratus Games – a game we reviewed last year and have found gets better -and punkier- with age. To enter, just click on this link and fill in a simple quiz. There are 10 questions, and for every correct answer, you’ll get one contest entry! In honor of the giveaway, here is the official Dice Hate Me review of Launch Pad from October 2010, including an updated rating reflecting our seasoned play since the review. From 1957 until the early 70s, the national super powers of the United States and the Soviet Union were pitted together in a heated head-to-head race for space. In their quest to reach the cosmos, each nation recruited top technicians and harvested vast resources, all while trying their best to protect their budding rockets from spies and saboteurs. Launch Pad is a lot like that, except this time imagine that JFK strapped on a rocket pack, flew over to Kruschev’s pad and booted him right in the kremlins. In Launch Pad the objective is simple: use resource cards to build cool spaceships, send them through quality control, and then roll ‘em out to the launch zone, ready to blast off. The more ships you get to the launch zone, the more points you score. The person with the highest score at the end of the game wins. Simple, right? Well, it would be if you didn’t have one to three other astrojerks trying to ruin your day on every turn. Insidious. Evil. Delightful. I call this combo "The Terminator." Abort Mission to terminate a player's rocket, Salvage the Abort from discard, and terminate another rocket. Much weeping and gnashing of teeth will ensue. During the game – while you’re just minding your own business building some righteous rockets – other players may come to possess cards on their turn that will allow them to do various dastardly things. 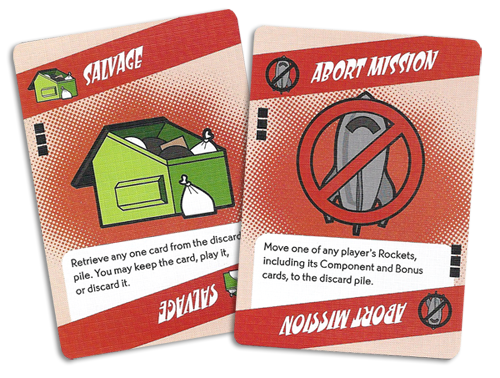 A Sabotage card allows a player to steal a necessary component from an opponent’s completed rocket, sending that rocket back to the construction zone. As an added bonus, that player gets to keep the component for building any of their rockets. 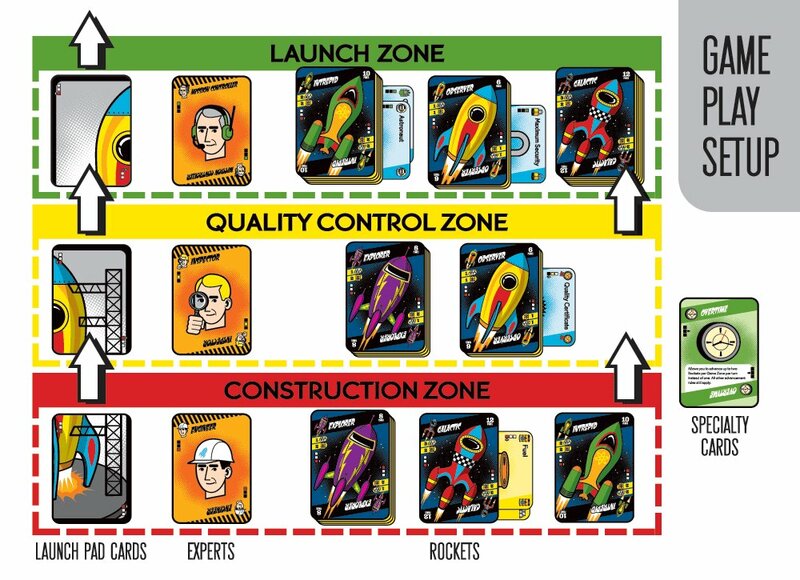 A Quality Check card will send a rocket back to the construction zone, as well, but it also forces the owner to discard any bonus cards (cards that grant extra points at game’s end) that have been played on the rocket. The low-down, dirty, rotten Abort Mission card is possibly the most evil in the deck; when played on an opponent’s rocket, that player must discard the rocket and every single card attached. There are a few really big rockets that take a long time to build in the game, so it’s not difficult to imagine the curses that spew forth when someone suddenly Aborts that sucker just as it’s ready to launch. There are various cards in the game that will allow players to play defense, as well. 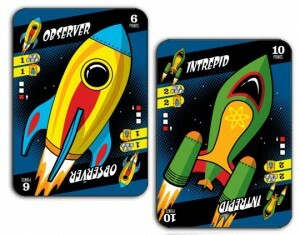 Maximum Security cards can be played on a rocket to protect them against attacks such as Sabotage and Abort Mission. Similarly, a Quality Certificate on a rocket will prevent a dreaded Quality Check. There are also Specialty cards in the deck that remain in play and give the owning player a special ability. A couple of the most useful of these are the Security System, which protects all of a player’s ships from attack, and the Warehouse, which allows a player to increase their maximum hand size from six to eight. And, yes, you guessed it – there are cards that allow players to steal opponents’ Specialty cards. It’s fun… until it happens to you. An interesting play mechanic that can provide much joy or frustration is the need for players to have certain Expert cards in play in order to advance rockets through each of the three card zones. In other words, in order to move a completed rocket from the Construction Zone into the Quality Control Zone, a player first needs to have an Engineer in play. To help out in a bind, there are three Jack of All Trades Experts in the game that can take the place of any missing Expert. To ramp up the mania or misery, there is also a Recruitment card in the game that allows a player to steal an Expert from any other player. Other than the Abort Mission card, this is the easiest way to really throw someone’s game into the crapper. To combat this crushing blow, a common wish in my game group has been the ability to move a Jack of All Trades Expert card to a different zone once it has been put into play. I have a feeling this will soon become a standard house rule. Overall, Launch Pad seems to have a good combination of victory and vexing, and with the excellent card mix, even a player who falls behind can find themselves back in the game within a couple of turns. This phenomenon is more pronounced in a three or four-player game as all the players do a fair job of picking on the rocketeer who is out in front. Because the powerhouses or bullies garner the most attention, playing a conservative, quiet game is often a good strategy for success. Launch Pad may not replace perennial favorites such as Bang! or Monopoly Deal in my lunchtime game group’s library, but it’s certain to join the rotation. After all, any game that can simultaneously bring a smile to one player’s face and a grimace to another’s is always guaranteed to be an absolute blast. Although the rulebook can be a tad daunting, at first, the gameplay is surprisingly intuitive and most players who have had any experience with card games will pick it up very quickly. With all the options, replay is fairly strong, but I can already see the need for some house rules to keep things fresh for the long haul. Who doesn't love Flash Gordon-like rocket ships and crisp, whimsical graphic elements? The artwork, card design and typography are superb, and the card stock - albeit a bit stiff, at first - is top notch and will stand up to a lot of shuffles. This game is a lot of fun - with the right group. The only reason I hesitate to elevate Launch Pad to five on the die is that it contains a significant amount of what I call "punk factor" - the ability to not only affect an opponent's play, but to also mess with their heads. For that reason, some games may end up with hurt feelings or changes in a will. (We have come to love Launch Pad for its punk factor since this first review, so the fun factor finally gets that bump to a five). Overall score: 14 out of 18 - All systems are go for fun. 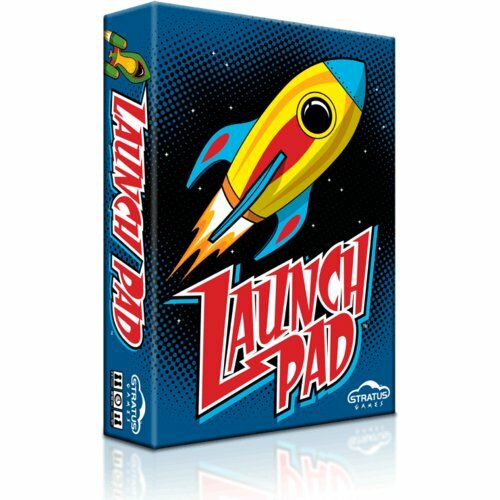 Launch Pad is a game for 2 to 4 space cadets, ages 10 and up, and is available for purchase at your favorite local game store or online at Stratus Games! Sounds a bit like Mille Bornes. But then again, Mille Bornes is fun to play from time to time, so you’ve made me interested to try this one out. Josh – Milles Bornes IS fun to play from time to time. But Launch Pad is definitely far less random, more tactical and much more punkish than Milles Borne could ever be. It’s a really fun game, with a neat atmosphere about it. Congrats on joining The Associated Gamers!